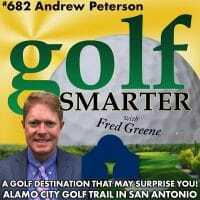 682: Andrew Peterson; President of the Alamo City Golf Trail in San Antonio, TX, joins us to talk about all the great and affordable options of places to play golf in San Antonio. The Alamo City Golf Trail is a combination of 8 public courses owned by the city. Their flagship course, Brackenridge Park, is also the home of the Texas Golf Hall of Fame. Andrew shares playing tips for his favorite par 4s, par3, and par5 holes at Brackenridge Park. This episode is brought to you by autoslash.com, a free service that finds the best price for your next rental car. Secure the best price for your next car rental at autoslash.com. They’re also the generous provider of three $100 Amazon Gift Cards that we’re giving away over the next few episodes to lucky listeners. Go to GolfSmarter.com/Autoslash to register. Congratulations to this week’s winner, Ken Cestari of Shrewsbury, NJ. Please vote https://goo.gl/forms/6N0fhCZutMXeD33f1 for the name of our new Golf Smarter podcast coming this spring. Each Friday we’re going to provide you with the best instruction from our archives that are no longer available because podcast distributors only carry 250-300 episodes and we have close to 700! Choose between 6 names that you’ve suggested and stay tuned! !